What a perfect image of a different way of life here down by the bay, three quarters of a century ago. I'd hoped the building might still be there, but there is no 107 Prospect Avenue any more. It's lost somewhere in the merge of Prospect Expressway into Gowanus. This picture is one of a series Sperr took in the neighborhood in '40 & '41, right around the time of expressway construction & removal of the elevated Fifth Avenue line. What strange, dystopian territories Moses created. I think of Ballard at this particular spot. The green triangle just below and to the right of Prospect Avenue (below), completely surrounded by highway, has for the last decade been home to two middle aged men, who were recently profiled in a New York Times article. The blur of blue you might make out amid the shrubs and grasses is a tent. There was a tragic motorbike accident around here a couple of months ago, when a motorbike rider lost control of the bike on the Gowanus Expressway, & he & his passenger fell to their deaths at Third & 17th. There's still a large & carefully tended shrine to the couple at the site. In the other direction, past the smaller triangle (a park, no less) where Prospect Avenue & 16th merge into Hamilton Avenue, you'll find the auto sales yard, where the mighty ape, Pithacus, once stood guard, a familiar sight from highway or viaduct until Sandy sent him to an unknown fate two years ago. His replacement, a squat & altogether more trifling figure, is there on Google, should you care to look, but was missing when I passed by the yard last week. 2014 marks the fortieth anniversary of Robert Caro's The Power Broker, the epic study of Robert Moses, and his impact on New York over forty years in office. I'm ashamed to say I've never read the book in its entirety, but I'm almost there now, at page 965 with a couple of hundred more to go. What a complete idiot I've been to have left this so long. You can listen to a recent interview with Caro, on WNYC, right here. I found a Standard Union article concerning 107 Prospect, from February 1931. 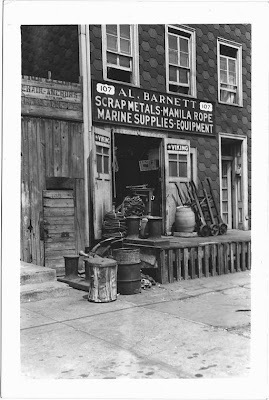 Alexander Barnett, the owner of the store pictured above, was found guilty of purchasing a ship's compass stolen from a tug boat, and of shoddy bookkeeping. He paid a twenty-five dollar fine. His wife Esther, though, is the figure that gives the story vigor, and provides its title: CALLED POLICE 'ROTTEN LIARS'; TAKES IT BACK. The Barnetts lived several blocks away, at 105 14th Street. Today an industrial warehouse replaces their home, but pleasingly enough, there's still a nautical connection. Seaboard Marine Elec. 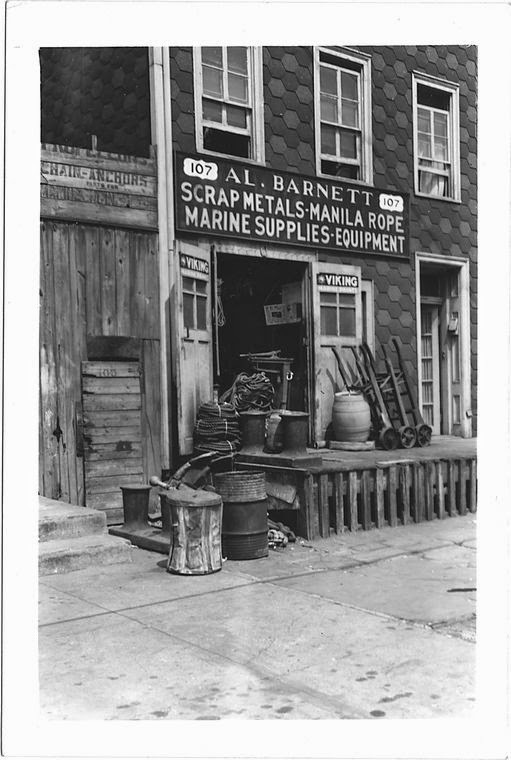 Co., Inc. - Marine & Industrial Repair.